Sometimes a mathematical phrase offers a splendid concentration of meaning in an otherwise non-mathematical poem. This is the case in the poem below by Taylor Mali, teacher and slam poet. Donna Masini, one of my poetry teachers at Hunter College, offered this rule of thumb for use of a particular word in a poem: the word should serve the poem in (at least) two ways -- in meaning and sound, or sound and motion, or motion and image, or . .. .
"On the Life of Ptolemy"
Poetry at its best uses words in new ways. Mathematics sometimes does that also. But for a poet to use mathematical terms in new ways can be risky. Nichita Stanescu (Romania, 1933 - 1983) was a poet unafraid to take that risk. Here is Sean Cotter's translation of Stanescu's "On the Life of Ptolemy" from the new and fine Stanescu collection, Wheel with a Single Spoke. The Journal of Humanistic Mathematics will host a reading of poetry-with-mathematics at the annual Joint Mathematics Meetings (JMM) on Friday, January 11, 5 - 7 PM in Room 3, Upper Level, San Diego Convention Center. If you wish to attend the reading and participate, please send, by December 1, 2012 (via e-mail, to Gizem Karaali (gizem.karaali@pomona.edu)) up to 3 poems that involve mathematics (in content or structure, or both) -- no more than 3 pages -- and a 25 word bio. In the midst of a teaching career in Bloomsburg University I spent a year in an administrative position -- the school needed time to search for a proper provost and I was deemed good enough for the interim. My good fortune during that year was to work closely with Kalyan, a highly competent man, born in India, who went on (as I did not) to become a college president. Kalyan and I liked each other and early in the year we shared our views that we were both from "work twice as hard" categories. That is, a woman or a dark-skinned man needs to work twice as hard as a white man to achieve recognition as the performance-equal of that white man. Today's poem is not only a fine work of art, it is also -- for me-- a doorway to memory. I first heard it in the poet's voice when he visited Bloomsburg University in the late 1980s, and I was alerted to the reading and to James Galvin's work by my most dear friend, BU Professor of English Ervene Gulley (1943-2008). Ervene had been a mathematics major as an undergraduate but moved on from abstract algebra to Shakespeare. Her compassion, her broad-seeing view, and her fierce logic served her well in the study and teaching of literature. And in friendship. I miss her daily. She, like Galvin, questioned life and probed its geometry. Benjamin Banneker (1731 - 1806) was a free African American mathematician and almanac author -- also an astronomer, surveyor, and farmer. (I learned of his work through my friend Greg Coxson, an engineer, teacher, and fan of mathematical poetry -- and Coxson learned of Banneker through a school project of his son.) 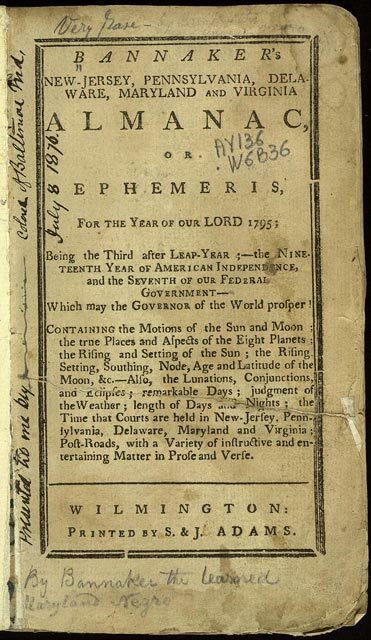 Beyond building a wooden clock and helping to lay out the borders of Washington, DC, Banneker predicted the 1789 solar eclipse and included rhyming math puzzles in his almanac. Coxson introduced me to a fine website, established by by John F. Mahoney of Washington, DC's Benjamin Banneker Academic High School, entitled The Mathematical Puzzles of Benjamin Banneker. A few days ago, on August 21, it was Poet's Day in New Zealand and the blog sciencelens.com featured a math-poetry theme; that posting mentions the anthology, Strange Attractors: Poems of Love and Mathematics (for which Sarah Glaz and I are co-editors) and offers several Fibs, poems whose syllable-counts follow the first six non-zero Fibonacci numbers (1, 1, 2, 3, 5, 8, . . .., with each succeeding number the sum of the two preceding). What is mathematics to animals? In a playfully serious volume of verses by Eugene Ostashevsky we meet his alter ego, the "new philosopher" DJ Spinoza. With the intelligence and bravery of the other philosopher-Spinoza (Baruch / Benedict, 1632 - 1677), Ostachevsky's Spinoza pokes a bit of fun at things that might be taken too seriously -- such as logic or mathematics or . . .
From the 2005 Summer issue of from Prairie Schooner we have this haunting poem by Diane Mehta about the unknown probabilities of life and not-life. Phyllis Diller (1917-20120), outspoken and funny, pioneering female comedian, died Monday, August 20. Her self-deprecating humor was hugely hilarious -- and it helped the rest of us also not to take ourselves too seriously. In honor of Phyllis Diller and humor, I first offer a link to a "poem" from a favorite math-cartoonist -- Randall Munroe offers an amusing rhyming critique of the various majors (including math) available to undergraduates -- at xkcd.com. And, below, I share several slightly funny math jokes adapted from ones found at Math Jokes 4 Mathy Folks and shaped into 4x4 or 5x5 syllable-square poems. One of the delights of investigation -- in library books or on the internet or walking about in the world -- is that one bit of information opens doors to lots of others. And so, as I was learning about Eleanor Graham for Monday's posting, I found her essay entitled "The first time I saw Carl Sandburg he didn't see me" and was reminded in a new way of the ongoing debate about the value of formal constraints in poetry. One of my poetry collections is a particular treasure because of its history. My aunt, Ruth Margaret Simpson Robinson, graduated (as I also did) from Westminster College in New Wilmington, Pennsylvania. At Westminster, a Chi Omega sorority sister of Aunt Ruth was Eleanor Graham Vance (1908-1985) who became a teacher and a writer; one of her biographical sketches mentions that she wrote for both children and adults, seeing many similarities between them. Aunt Ruth passed on to me her personally-inscribed copy of Eleanor Graham's 1939 collection, For These Moments, and in it I have found a poem with a tiny bit of arithmetic. I offer it here to you. This poem by recent (2008-2010) poet laureate Kay Ryan at first made me think of calculus, of integration, summing all the thin slices to find the area under a curve. And then the poem moved me on. One of my favorite DC-area poet-people is Yvette Neisser Moreno -- who, besides giving us her own work, is active in translation of Spanish-language poetry into English, most recently (with Patricia Bejarano Fisher) a Spanish and English edition of Venezuelan poet Maria Teresa Ogliastri’s South Pole/Polo Sur (Settlement House, 2011). Although I have not found any mathematical poems by Moreno, I learned from an interview that the Chilean Nobelist Pablo Neruda (1904-1973) is her favorite poet and I therefore present here the geometrically vivid opening opening stanza of Part XI of Neruda's well-known long poem, The Heights of Macchu Pichu: A Bilingual Edition (The Noonday Press, 1966). Volume 2, Issue 2 (July 2012) of the Journal of Humanistic Mathematics has recently become available online -- and it has lots of poetry. One valuable resource has been gathered by Charlotte Henderson, a participant in the January 2012 poetry reading at JMM in Boston; Charlotte offers a report on that reading and also has prepared a folder of the poems read there, collected for our ongoing enjoyment. In this issue also there are poems by Florin Diacu, Ursula Whitcher, and Paige S. Orland and some kind words about this blog by Gregory E. Coxson (JoAnne Growney's Poetry-With-Mathematics Blog -- An Appreciation); many thanks, Greg. In the wake of the BRIDGES math-art conference at Towson University last week I also want to mention the lively blog posting about BRIDGES by Justin Lanier at Math Munch. In his poem, "Arithmetic on the Frontier," Rudyard Kipling (1865-1936) wrote of Britain's nineteenth century military aggression in Afghanistan. His words remind us of important questions: what is the cost of a life lost in battle? are some lives cheap and some more dear? On Monday, October 17, 2011, Israel Lewis Schneider (1924-2011) -- Silver Spring poet and mechanical engineer -- passed away. I did not learn of this death until yesterday -- when my colleague, Sarah Glaz, let me know that an e-mail to him had bounced back and I went online searching for him. Developing an inventory -- of what we have or have experienced, of what we see or imagine -- inevitably involves numbers and counting. As in "Inventory" by Canadian poet Colin Morton, an adaptation or "free translation" of "Inventaire" by Jacques Prevert. Morton has a strong connection to mathematics -- his son is a mathematician at the Technical University of Lisbon. Before calculators we did more counting! One of many sources of good poetry online is American Life in Poetry, collected by former U S Poet Laureate Ted Kooser. In Column 368, Kooser offers "Numbers" by New Jersey poet, Jared Harel (first published Fall 2010 in The Cold Mountain Review). Kooser's introduction notes, "My mother kept a handwritten record of every cent she spent from the day she and my father were married until the day she died. So it’s no wonder I especially like this poem . . . "